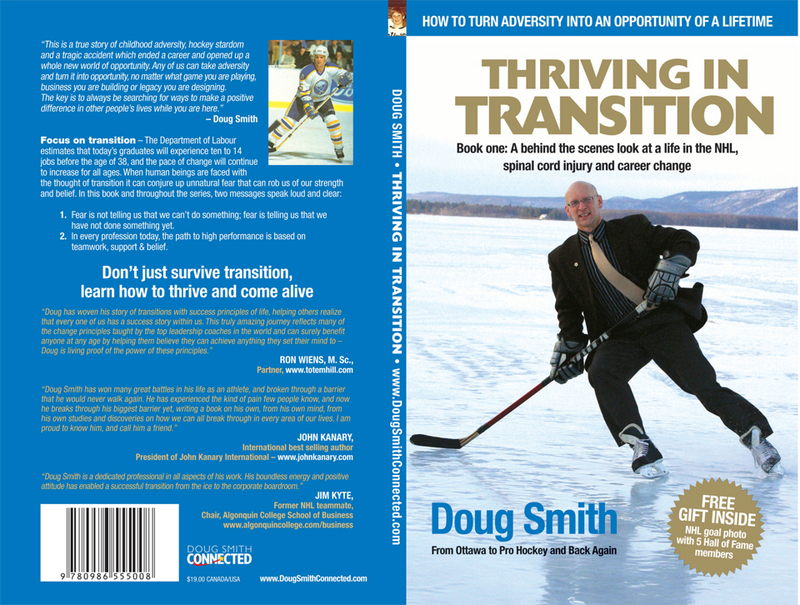 Doug Smith has lived one of the most awe-inspiring stories of overcoming adversity. Since interviewing him through work in early 2010, I’ve come back to his wisdom and philosophy many times in coping with my own injuries (chronic and frustrating, yes, but nothing compared to what he survived). I asked him to be part of this website because he’s helped me stay positive and focused, and I want to do what I can to share his story so others can draw strength from his experiences. If you aren’t familiar with pro hockey, you may need a bit of a crash course in Doug’s career. The man is nothing short of a sports prodigy. As a new graduate from Ottawa’s Bell High School in 1981, he had the option of pursuing a professional career in four different sports—golf, lacrosse, tennis and hockey. Thanks to his parents’ predilection for the ice, he ended up taking a spot on the Los Angeles Kings when he was selected as a first-round draft pick. From there, he went on to play for the Buffalo Sabres, Edmonton Oilers, Vancouver Canucks and Pittsburgh Penguins. Doug’s time on the Buffalo Sabers holds his fondest memories of the sport, an experience he likens to being a rock star. “There was a constant line-up that existed in front of you telling you that you were something special,” he says. “It never ended.” The highlight of his professional hockey career came in 1986 during his third game with the Sabers, in which he matched up against Wayne Gretzky and Mark Messier on the Edmonton Oilers—the Stanley Cup champions at the time. ‘Doug Smith’ became a household name, and all signs pointed to a long and lucrative NHL career. But in the summer of 1988, a head-on collision on Ontario’s Callabogie Road left him with a severed scapula and massive nerve damage in his shoulder. He was told he’d never play pro hockey again. Fortunately for Doug, he was never one to let others define his boundaries. Less than a month after being given the go-ahead to start lifting weights, he’d packed on 25 pounds of muscle. Within a matter of weeks, he was signed to the Edmonton Oilers. Not only did he play pro hockey again, he played for another four years. As it turned out, the 1988 collision wasn’t to be his last head-on trauma. 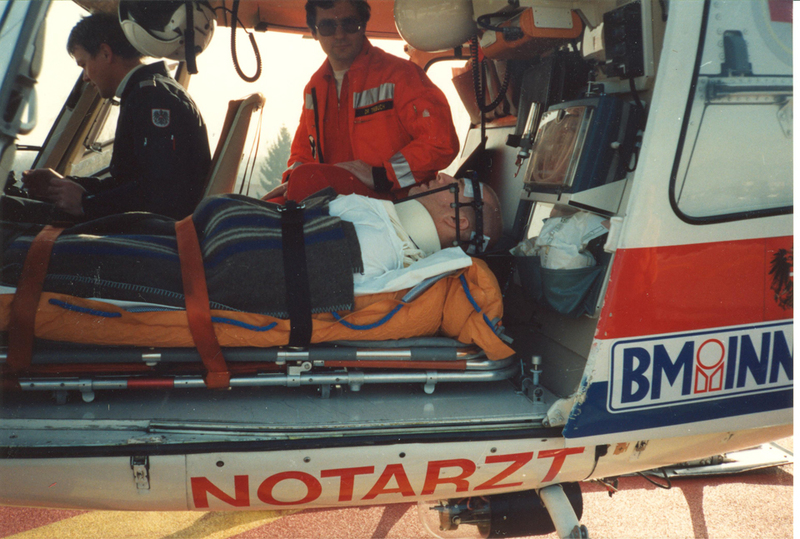 When he was playing in the European Hockey League in 1992 he suffered a far greater injury. Going at full speed on a fore-check, he slammed into the boards and shattered his neck in more than 100 places. Complications from the injury left him paralyzed. It was just one week after the birth of his second daughter. While recovering from his first collision, he never doubted he’d be back on the ice. The second time around, he didn’t feel he had the strength to keep going. That’s when he relied on the strength of those around him to pull through. With the support of his family, Doug narrowed his focus on doing exactly what needed to be done, one step at a time. During the year he spent in a hospital bed recovering his physical strength, he also rallied his inner strength; he became one with his computer, teaching himself the fundamentals of business. When he was released from the hospital and standing on his own two feet—defying medical odds once again—he wasted little time getting started. Among other ventures, he launched Arc Stainless Inc., a business that started in his garage and has since grown into a highly profitable stainless steel medical and architectural products company, with an impressive list of clients that includes The Ottawa Hospital (TOH) General Campus. He’s accomplishing that goal through a series of books that reflect on his personal experiences and demonstrate how his approach to overcoming obstacles can be applied to success in any area. The key, he says, is understanding how the subconscious mind communicates with the conscious mind. His first book, Thriving in Transition, was released in spring 2010. It outlines his life story from birth to the year after his spinal cord injury. He also co-authored a book called The Power of the Platform, which was published by the Las Vegas Convention Speaker’s Bureau. In spring 2011, he’ll release The Trauma Code, his first publication with business partner John Brooks. It’s in The Trauma Code that Doug explores the impact of the subconscious mind, and helps uncover the code to being able to communicate with that part of the brain. As he explains, each of us has been conditioned to see ourselves in a certain light. Such conditioning governs our performance, our success, even our happiness. Recognizing and understanding that conditioning is essential to breaking through and realizing one’s potential. Given the extremity of the obstacles Doug has surmounted, I ask whether he still gets irritated by life’s smaller challenges—getting a cold, having old injuries act up. He makes it clear that he’s just as frustrated as the next person when his physical limitations get in the way. But because he’s been using what he calls the keys to unlocking the door to his subconscious, he’s in a much better position to assess the situation objectively and make positive choices. That’s a lesson Doug took several years to learn. Looking back on his days in the NHL, he sees now that was very reactive and not prone to thinking things through. In Doug’s case, he was hit plenty hard. Twice. Before the second collision in 1992, his focus was almost entirely on him and meeting the goals he’d set out. “On the ice, it was all about winning,” he says. “It was all about being the best in the world at something. Since ending his professional hockey career, Doug has found many ways of giving back to the community. 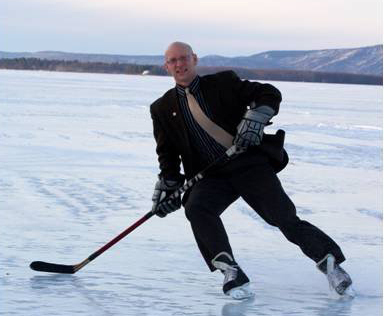 While he was still in the hospital, he began plans to launch the Ottawa Senators Alumni Association, and he continues to be actively involved. Thanks to his efforts, the association has raised more than $3 million for local charities, including the Children’s Hospital of Eastern Ontario (CHEO) and Rogers House. He’s especially proud to have contributed to the Ottawa Rehabilitation Centre at TOH General Campus, where he lived during his recovery, and to the Campus’ new virtual reality system that helps members of the Canadian Forces recover from spinal cord or head injuries, or from the loss of a limb. Doug sees the symmetry in the fact that his professional hockey career has enabled him to make such significant contributions; in his mind, he’s come full circle. He went into the sport focused solely on him. Today, he’s in a position to help others benefit from his experiences, both through his connections to the hockey world and through the lessons he learned from his injuries. The Trauma Code will be released in spring 2011. For the latest information, visit thetraumacode.com. 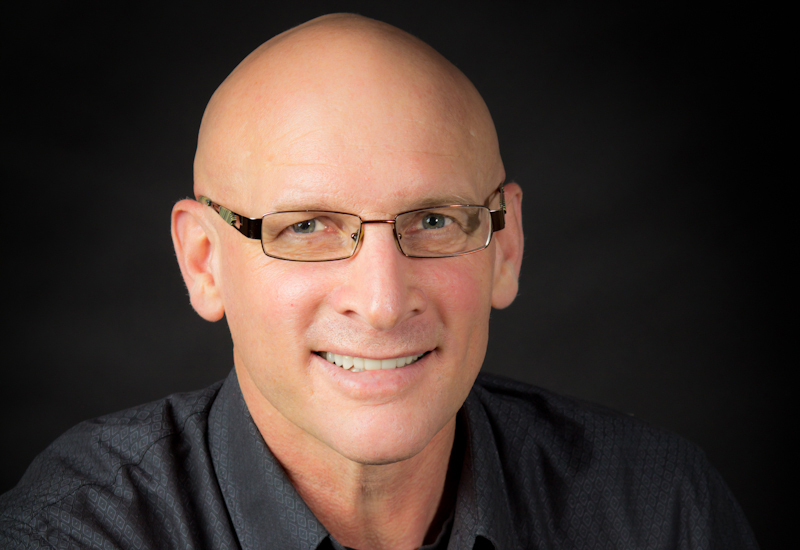 For more on Doug, follow him on LinkedIn and @DSENetwork on Twitter, or email doug@dougsmithperformance.com. Doug is an old and good friend of mine. I have read his books and am always inspired by his story, thoughts and out look on life. Keep up the good work Doug. I am a life-long L.A. Kings fan that remembers Doug Smith very well. My Dad and I were reminiscing about the Kings during the Stanley Cup finals, and recalled the tragedy that paralyzed Doug. I Googled his name to find out whatever happened to him. To our joy and amazement, we discovered Doug was walking/SKATING around! Way to go, Doug! Glad to see everything has worked out for you. Your story should be made into a movie. I hope to see you at a future Kings reunion. Thanks for the comment, Steve! You’re right, it’s an incredible story. Glad you found its happy ending! Your courage inspired me to become a better/positive person. Thank you. As always, Doug, you’re an inspiration. Give Patti our best and keep in touch.